Is your teen or preteen excited for the start of a new school year? Or does the thought of another school year cause them anxiety and stress? Does your teen love learning and excel at academics? Or does your teen struggle with learning and find school difficult? No matter what type of learner your teen is, you can always prepare them for a great start to another school year. With proper preparation, your teen can have the tools necessary to take on any class, no matter the difficulty level!! 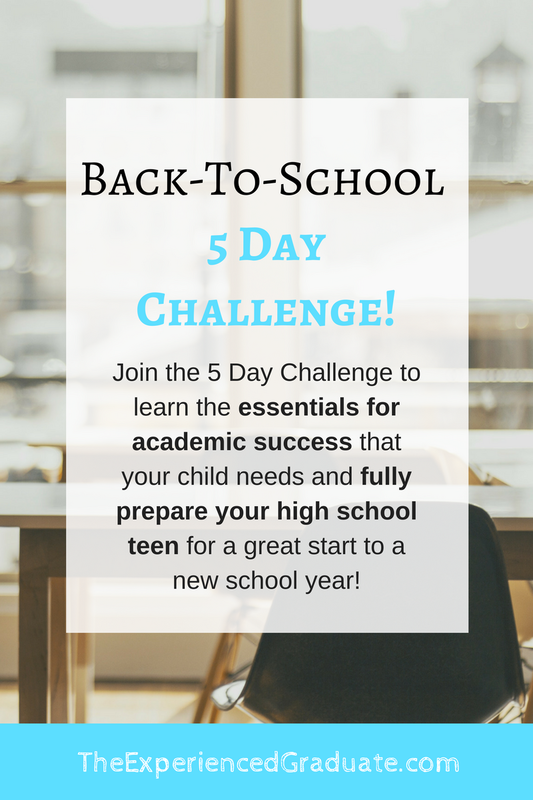 The Back to School 5 Day Challenge is for parents of teens and preteens that are preparing to start another school year (or have just started the new year). This Challenge will help you prepare your child with the right tools, systems, and habits to start the new school year strong, and have high grades from Week 1. Many students may start a year strong, but quickly fall behind with their grades by the end of the first quarter. It's only after students are struggling in a class that some parents find help for their kids. You can help your child right now by learning how to help them from the very first academic quarter!! What does the 5 Day Challenge include? Every day for 5 Days, you will receive a new Lesson Instruction on what steps you can take to teach your teen the right skills needed for academic success. Each lesson will include actionable steps for you to take in order to prepare your child for school. You will also get downloads, printables, and videos, to give you the best resources to help your child! Don't wait until your child is already falling behind! Don't wait to get help for your teen until your child is already struggling in school. You can get the help NOW by taking the 5 Day Challenge and learning the skills your child needs for academic success.